Lanai Slack Key Festival 2014 at Four Seasons, The Lodge at Koele. 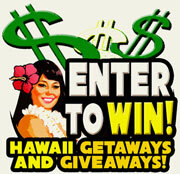 DECEMBER 19th, 20th & 21st – Call 808-565-4000 to book your room now! Aloha Slack Key Guitar Lovers! Join us at the 4th Annual Lana’i SLACK KEY FESTIVAL Dec. 19th, 20th and 21st, 2014 on the island of Lana’i at The Four Seasons Resort, Lodge at Koele and Manele Bay! Call now to book your room. 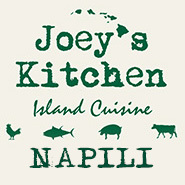 808-565-4000 for reservations! FOUR SEASONS RESORTS LANAI PRESENTS THE LĀNA‘I SLACK KEY GUITAR FESTIVAL! 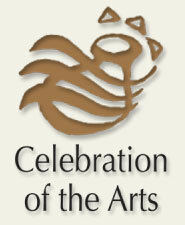 Three Days of FREE concerts & workshops led by Na Hoku Winning Artists! Four Seasons Resorts Lāna‘i, in partnership with the Lāna‘i community, HawaiiONTV.com and Jazz Alley TV, is pleased to announce the fourth annual Lāna‘i Slack Key Guitar Festival Dec. 19-21, 2014. During the three-day festival, guests will be treated to complimentary performances by Na Hoku Hanohano Award-winning artists including: Palani Vaughan, Kevin Brown, Benny Uyetake, Brother Noland, Darren Lopez and other special guests! “Music is an integral part of Hawaiian culture, which is what makes Lāna‘i and Hawai‘i so special,” said Tom Roelens, General Manager, Four Seasons Resorts Lāna‘i. 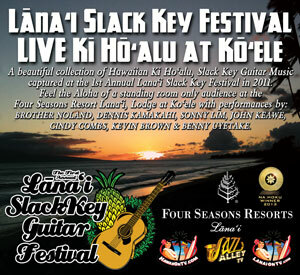 “We feel privileged to host the Lāna‘i Slack Key Guitar Festival, an event that brings our community together with our resort guests, for three days of incredible music by some of Hawai‘i’s best artists.” “To create a FREE Hawaiian Slack Key Guitar -Kiho’Alu Festival with the worlds’ best musicians, at nine venues throughout Lana’i, has turned out to be a wonderful communitty event of true Aloha with memories that will last forever.” said Kenneth K. Martinez Burgmaier, Maui Filmmaker & Founder/Producer of the Festival. 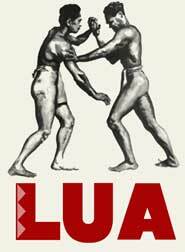 9am- 2pm: Strolling Slack Key Masters in Lāna‘i City! Strolling Slack Key Guitars through Lanai City, with Na Hoku Winners Kevin Brown, Benny Uyetake & Damon Parillo at Coffee Works, Cafe 565, Mimi’s Place, Canoes, The Local Gentry, Anuenue Juice Bar, Mike Carroll Art Gallery and The Lanai Culture & Heritage Center! Award Winning Slack Key Guitar Performances by Palani Vaughan, Kevin Brown, Benny Uyetake, John & Hope Keawe, Brother Noland, Darren Lopez and other special guests! Lanai City, Hawaii 96763 U.S.A.
Taiko drum girls at third Lanai ukulele festival..
Join Four Seasons Resorts Lana’i, with HawaiiOnTV.com & Jazz Alley TV, for the 4th Annual Lana’i UKULELE FESTIVAL June 20th – 22nd, 2014 on the island of Lana’i at The Four Seasons Resort, Lodge at Koele! ALL FREE EVENTS with amazing ukulele music over the entire weekend! Enjoy the music of Na Hoku Winners Paula Fuga, Benny Uyetake and Sheldon Brown, Friday June 20th from 7pm-9pm in The Great Hall at the Lodge at Koele. All day Saturday (June 21st from 9am-2pm) enjoy strolling Ukueles with Benny and Sheldon in Lanai City at Coffee Works, Cafe 565, Mimi’s Place, Canoes, The Local Gentry, Anuenue Juice Bar, The Mike Carroll Art Gallery and the Lanai Culture and Heritage Center. 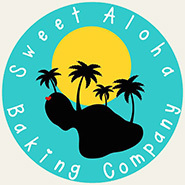 Join Paula Fuga from 10:30-11am at The Lanai Culture and Heritage Center for Ukulele Talk Story. Spend your evening enjoying amazing Ukulele Music in The Great Hall at the Lodge at Koele from 6pm-9pm, with Na Hoku Winners Paula Fuga, Sheldon Brown and Benny Uyetake. Sunday morning Ukulele Breafast from 10am-1pm with Benny and the music continues for an Ukulele Sunday Dinner from 7-9pm! 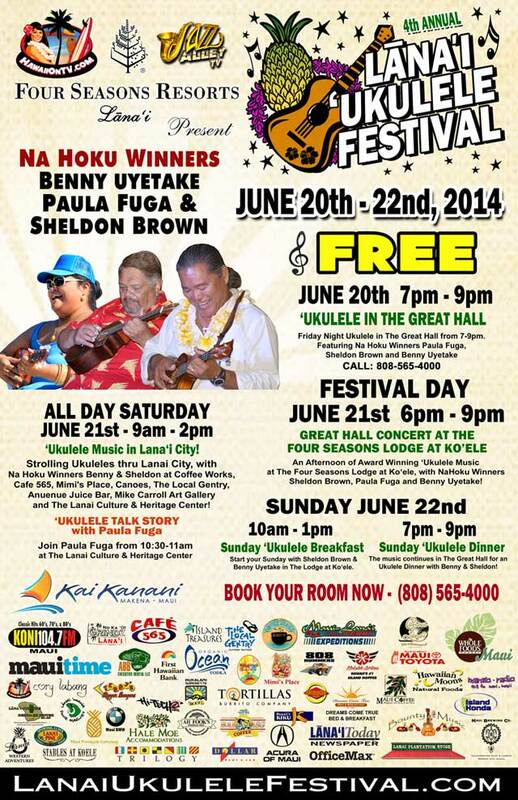 Call Four Seasons Resorts to Book Your Ukulele Festival Weekend! 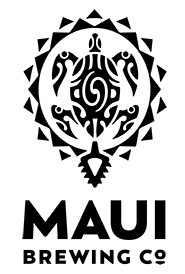 Mention that you are attending the Ukulele Festival! Four Seasons Resorts Lanai, with HawaiiOnTV.com and JazzAlleyTV.com, present the 4th Annual Lanai Jazz Festival, March 7-9, 2014. The Jazz Festival weekend on Lanai will be full of special events, including performances by Grammy Nominated Jazz Hall of Fame Legend Bobby Watson (from Kansas City) and Grammy Winner Skip Martin (from Dazz Band and Kool & The Gang). Jazz Duo with Fulton Tashombe (from the Whisperers) & Paul Bunuan (Sax & Nose Flute Master), Jazz Guitar Duo Damon Parillo & Ron Hetteen, 2013 Na Hoku Award Winner Benny Uyetake and The Jazz Alley TV Quartet with John Zangrando on Sax, Paul Marchetti on Drums, Doug White on Bass & Fulton Tashombe on Piano. 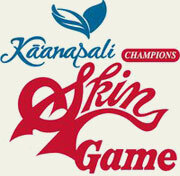 Call the Four Seasons Resorts for Kamaaina Rates and to book room reservations for this amazing weekend! 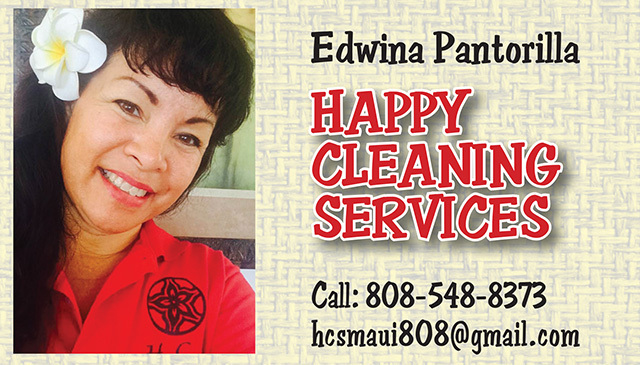 808-565-4000. 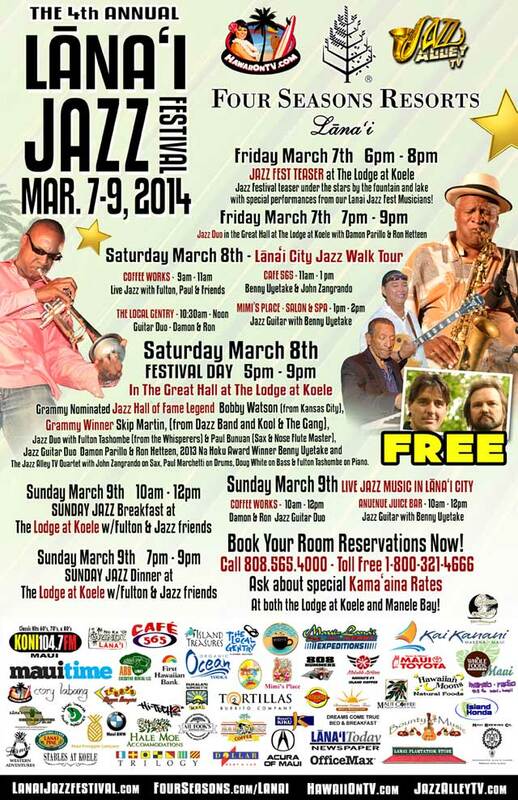 The Lanai Jazz Festival kicks off Friday night, March 7th with a JAZZ FEST TEASER at The Lodge at Koele. Jazz Festival teaser from 6pm to 8pm under the stars by the fountain and lake, with special performances from our Lanai Jazz Fest Musicians! Move inside to the Great Hall from 7pm – 9pm and listen to Jazz Duo Damon Parillo & Ron Hetteen. 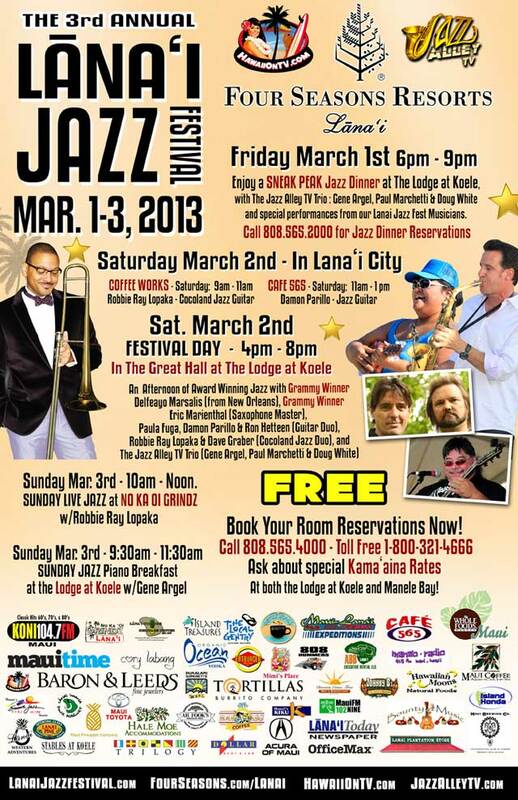 The Lanai Jazz Festival begins at 5pm Saturday evening, March 8th in The Great Hall at The Lodge at Koele. 4 hours of Grammy Award Winning music on beautiful Lanai. Music will wrap at 9pm. 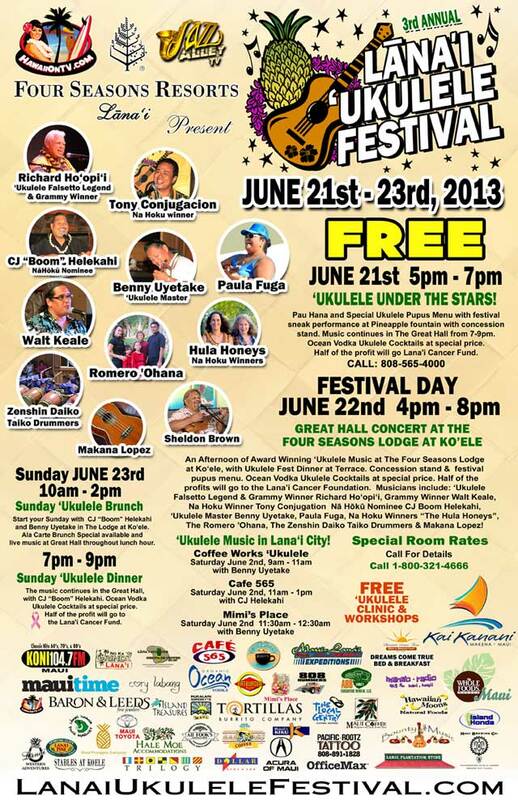 The Lodge at Koele is a special place to enjoy this 2014 Jazz Fest! 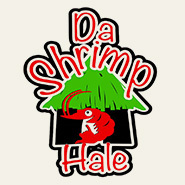 Enjoy the food, the atmosphere, the music and the Aloha!! The weekend comes to a close on Sunday March 9th with a Sunday Jazz Breakfast at the Lodge at Koele from 10am – 12pm. Music with Fulton and Jazz Friends. You can also go into Lanai City for more local jazz at Coffee Works from 10am – 12pm with Damon and Ron and at Anuenue Juice Bar from 10am – 12pm with Benny Uyetake. Dinner plans? Sunday Jazz Dinner at The Lodge at Koele from 7pm – 9pm with Fulton and Jazz Friends. 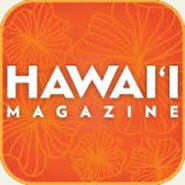 Lanai Slack Key Festival 2013 at Four Seasons Resorts Lanai 800-321-4666. Call now to book your room. 1-800-321-4666 for reservations! Saturday August 3rd…Start your Saturday off with a morning Slack Key Jam at Coffee Works! 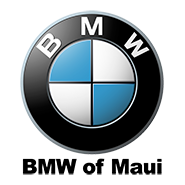 9am – 11am with Kevin and Ikaika Brown. Stop by Lanai City’s newest hot spot, Anuenue Juice Bar & Cafe from 9-11am for Slack Key with Benny Uyetake!. Benny Uyetake will also perform from 11am-Noon at the Mike Carroll Gallery! Join Sonny Lim at Cafe 565 for a Slack Key Guitar Lunch from 11am-1pm! Damon Parillo will perform at Mimi’s Place from 11am-Noon, as well as at The Local Gentry from 1pm-2pm. 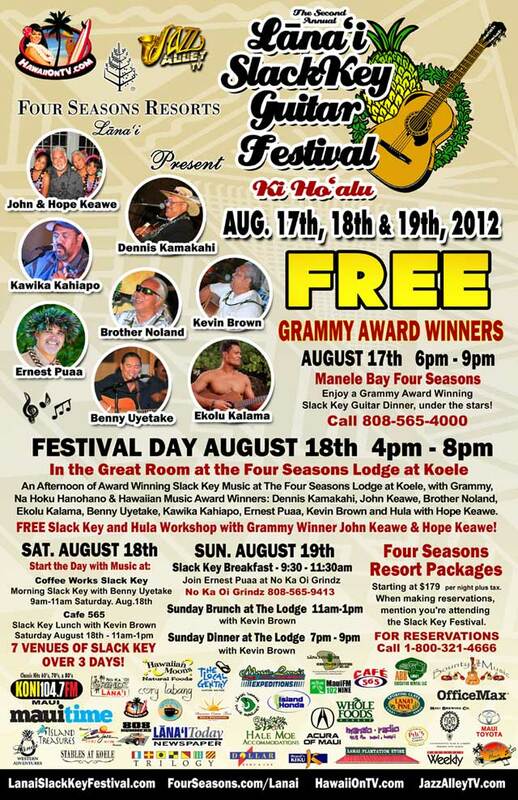 August 3rd, the Slack Key Festival starts at 5pm in the Great Hall at The Four Seasons Resort, Lodge at Koele! Featuring Grammy & Na Hoku Hanohano Winning Slack Key Masters! 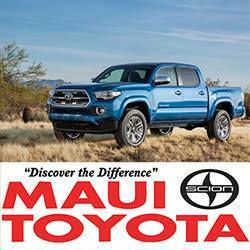 Enjoy an Afternoon of Award Winning Slack Key Music at The Four Seasons Lodge at Koele, with Grammy, Na Hoku Hanohano & Hawaiian Music Award Winners: Palani Vaughan, Dennis Kamakahi, Sonny Lim, Kevin & Ikaika Brown, John Keawe, Damon Parillo, Benny Uyetake, Cindy Combs, Ernest Puaa, Marty Wilson & The Hawaiian LUA Warriors! FREE Workshops!!. SLACK KEY WORKSHOP with John Keawe Sat.1-2pm Music Room. NOSE FLUTE WORKSHOP with Calvin Hoe Sat. 2-3pm Front Porch Lanai. UKULELE WORKSHOP with Benny Uyetake Sat. 3-4pm Koele Music Room. The Festival continues on Sunday August 4th, with Morning Coffee at “Coffee Works” with Damon Parillo from 10-Noon. Sonny Lim and Benny Uyetake will perform at The Lodge at Koele’s Sunday Brunch, from 11am-1pm. Enjoy Sunday Dinner with Grammy Winner Sonny Lim from 7-9pm in the Great Hall at The Lodge! 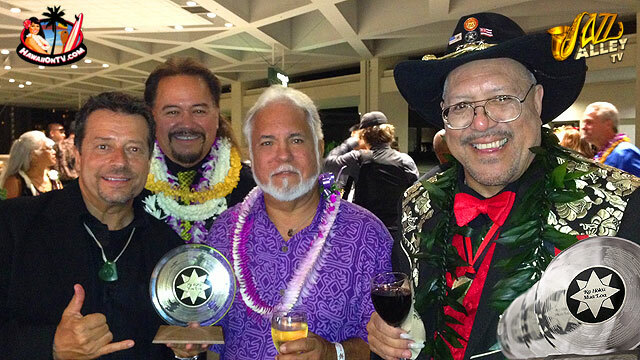 2013 Na Hoku Award Winners – Jazz Alley TV Productions! 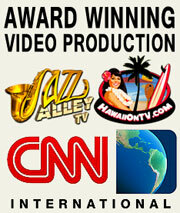 Congratulations to Jazz Alley TV & HawaiiOnTV.com for helping our Ohana bring home 9 Na Hoku Hanohano Awards for 2013! 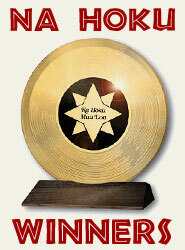 The 2013 Na Hoku HanoHano Awards presented the award for Best Compilation CD for The Lanai Slack Key Festival – “Live Ki HoAlu at Koele”. An amazing mix of incredible Live Slack Key music produced by Jazz Alley TV’s Kenneth K. Martinez Burgmaier, John Keawe, Dennis Kamakahi, Benny Uyetake, Sonny Lim, Brother Noland, Kevin Brown, Cindy Combs as well as HawaiiOnTv.com’s Dave Lower. Many Mahalos to Live Engineer Darren Lopez from Polihua Productions, with Final Master and Mix by Award Winning Audio Engineer Dave Russell. 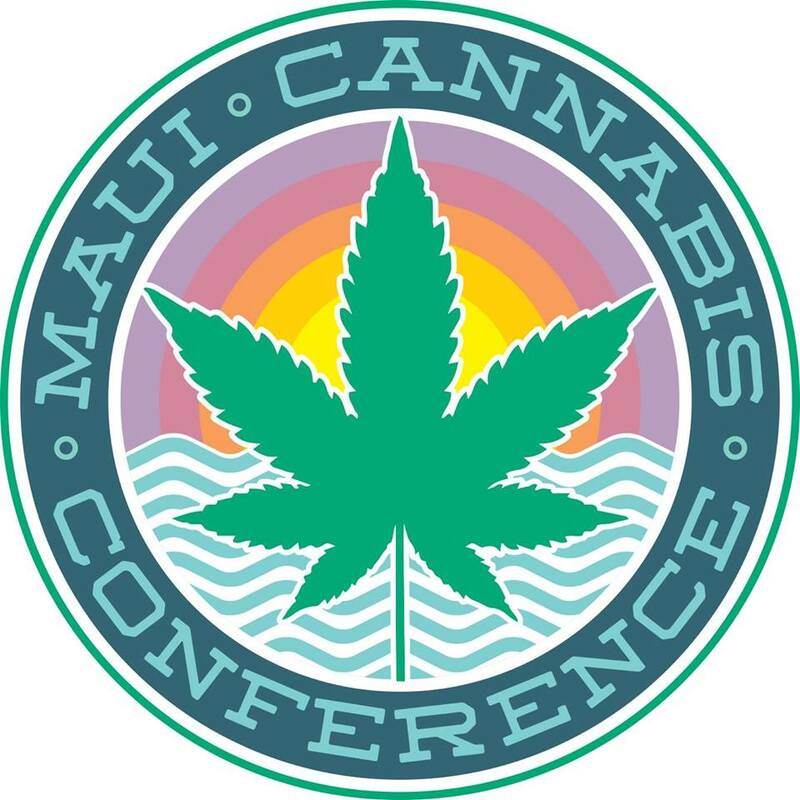 Special Thanks to The Four Seasons Resorts Lanai – The Lodge at Koele for hosting this amazing annual event! Join Four Seasons Resorts Lana’i, with HawaiiOnTV.com & Jazz Alley TV, for the 3rd Annual Lana’i UKULELE FESTIVAL June 21st – 23rd, 2013 on the island of Lana’i at The Four Seasons Resort, Lodge at Koele! The Lanai Jazz Festival kicks off Friday night, March 1st with live music in the Great Hall at The Lodge at Koele, from 6-9pm. Enjoy an evening with The Jazz Alley TV Trio and special Sneak Peak performances from the Jazz Fest musicians. Saturday March 2nd, you can start the day off in Lanai City at Coffee Works, where Robbie Ray Lopaka will be performing Live Cocoland Jazz from 9am-11am. Just down the street, you can enjoy a great tasting lunch at Cafe 565 while listening to the sounds of Damon Parillo’s Jazz Guitar. 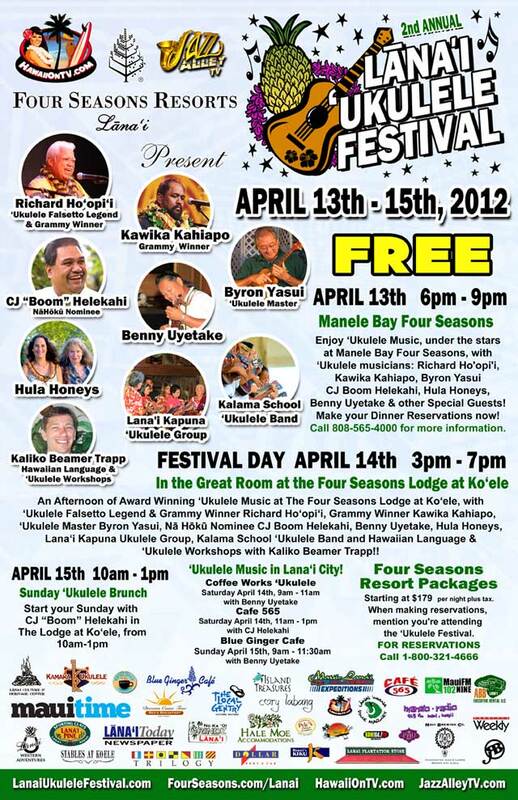 The Lanai Jazz Festival begins at 4pm Saturday evening, March 2nd in The Great Hall at The Lodge at Koele. 4 hours of Grammy Award Winning music on beautiful Lanai. Music will wrap at 8pm. The Lodge at Koele has a special Jazz Fest menu planned so everyone should truly enjoy the food, the atmosphere, the music and the Aloha!! The weekend comes to a close on Sunday March 3rd with Sunday Live Jazz at No Ka Oi Grindz in Lanai City, from 10am to Noon. Great tasting Gridz with amazing live jazz music from Robbie Ray Lopaka. If you’re at the Lodge at Koele, relax and enjoy a special Jazz Fest Breakfast from 9:30am to 11:30am, with Gene Argel. Four Seasons Resorts Lanai, with HawaiiOnTV.com and JazzAlleyTV.com, present the 3rd Lanai Film Festival, February 8th, 9th and 10th, 2013. The Film Festival weekend on Lanai will be full of special events, including award winning music from Paula Fuga, Kevin Brown and Grammy Winner Sonny Lim. There will also be performances by Cocoland Jazz Guitarist Robbie Ray! 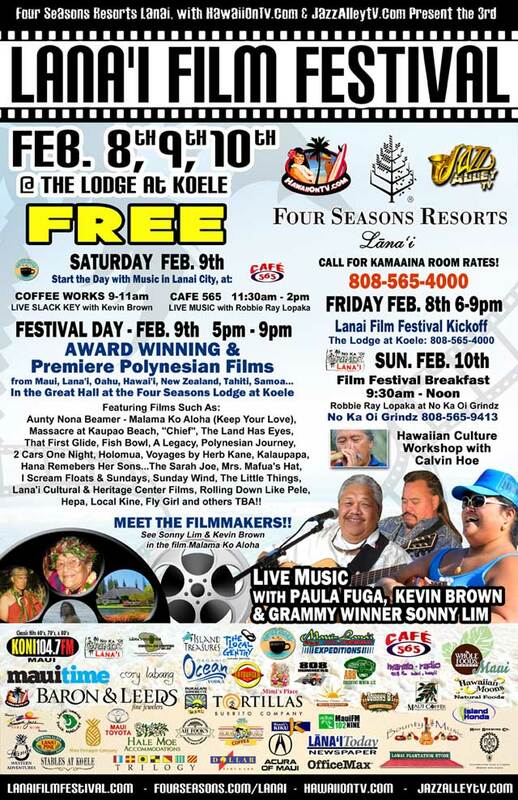 The festival kicks off Friday night, Feb. 8th with live music in the Great Hall at The Lodge at Koele, from 6-9pm. 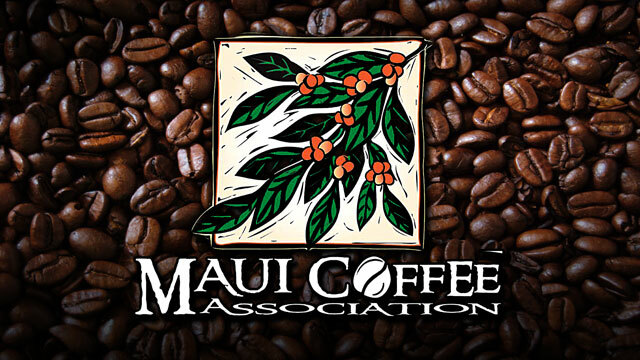 Saturday February 9th, you can start the day off in Lanai City at Coffee Works, where Kevin Brown will be performing Live Slack Key from 9am-11am. Just down the street, you can enjoy a great tasting lunch at Cafe 565 while listening to live music with Robbie Ray; Cocoland Jazz Guitar! 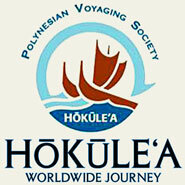 The Film Festival begins at 5pm Saturday evening, Feb.9th in The Great Hall at The Lodge at Koele. 4 hours of Award winning Music and Award Winning & Premiere Polynesian Films from Maui, Lana‘i, Oahu, Hawai’i Island, New Zealand, Tahiti and Samoa. And Don’t miss out on the Hawaiian Culture Workshops with Calvin Hoe. 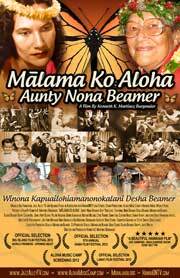 Aunty Nona Beamer – Malama Ko Aloha (Keep Your Love), Massacre at Kaupao Beach, “Chief”, The Land Has Eyes, That First Glide, Fish Bowl, A Legacy, Polynesian Journey, 2 Cars One Night, Holomua, Voyages by Herb Kane, Kalaupapa, Hana Remebers Her Sons…The Sarah Joe, Mrs. Mafua’s Hat, I Scream Floats & Sundays, Sunday Wind, The Little Things, Lana’i Cultural & Heritage Center Films, Rolling Down Like Pele, Hepa, Local Kine, Fly Girl and others TBA!!) Meet The Filmmakers too! Films will play until 9pm! The weekend comes to a close on Sunday Feb. 10th with a Film Festival Breakfast from 9:30 to Noon at No Ka Oi Grindz in Lana‘i City. Great tasting Gridz with amazing live music with Robbie Ray Lopaka. 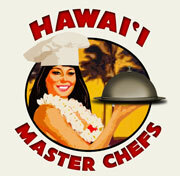 Lanai Slack Key Festival 2012 at Four Seasons Resorts Lanai 800-321-4666. Resort Packages are available now! Stay the entire weekend with rooms starting at only $179 at one of the Worlds finest Resorts! 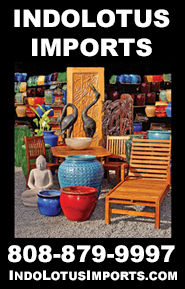 Call 1-800-321-4666 for reservations! The Four Seasons Resort, Lodge at Koele! Featuring Grammy & Na Hoku Hanohano Winning Slack Key Masters! John Keawe with his wife Hope performing Hula, Dennis Kamakahi, Kevin Brown, Kawika Kahiapo, Brother Noland, Ekolu Kalama, Benny Uyetake and Earnest Puaa. 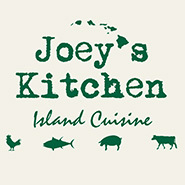 August 18th – FREE Slack Key & Hula Workshops with John and Hope Keawe. Grammy Winning Slack Key Guitar & Hula at The Four Seasons Resort, Lodge at Koele. 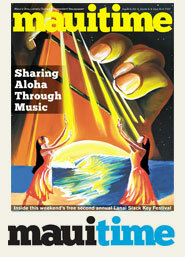 The Lana’i Slack Key Festival is presented by the Lana’i Four Seasons Resort Lodge at Koele & Manele Bay, HawaiiONTV.com, Jazz Alley TV, Maui-Lana’i Expeditions Ferry, Maui Time Weekly, Lana’i Western Adventures, No Ka Oi Grindz, Maui Brewing Co., Lana’i Today, Cafe 565, Coffee Works, Lana’i ‘Ohana Poki Market, Lana’i Culture & Heritage Center, Lana’i Pine Sporting Clays, Trilogy, Koni FM 104, Lana’i Plantation Store, Dollar rent-a Car, ABB Executive Rentals LLC, Dreams Come True B&B, KIKU TV, Whole Foods, Office Max, Bounty Music, Manao Radio, MauiFEST Hawai’i, LanaiONTV.com, Hale Moe Accommodations, Pele’s Other Garden, Acura of Maui, Maui Toyota, Island Honda, 808 Hummers, Cory Labang Designs, The Local Gentry, Island Treasures and all our Friends & Ohana! Join Four Seasons Resorts Lana’i, with HawaiiOnTV.com & Jazz Alley TV, for the 2nd Annual Lana’i UKULELE FESTIVAL April 13th – 15th, 2011 on the island of Lana’i at The Four Seasons Resort, Lodge at Koele and Manele Bay! ALL FREE EVENTS with 8 venues of ukulele music over the weekend! Resort Packages are available now! Stay the entire weekend with rooms starting at only $179 at one of the Worlds finest Resorts! Call 1-800-321-4666 for reservations! Mention that you are attending the Ukulele Festival! We’ll be kicking things off on Friday, April 13th with an incredible Ukulele Dinner at the Four Seasons Resort, Manele Bay. 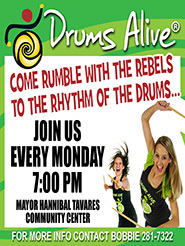 Award Winning Music from 6-9pm! 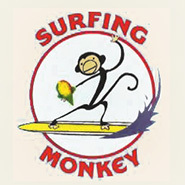 On Saturday, April 14th, start your day off with Benny Uyetake, at a morning Ukulele Jam at Coffee Works! 9am – 11am. 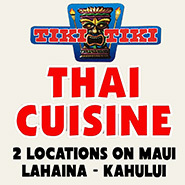 Then stop by Cafe 565 for an Ukelele Lunch with CJ Boom Helekahi, from 11am – 1pm! April 14th, the Ukulele Fest starts at 4pm in the Great Room at The Four Seasons Resort, Lodge at Koele! An Afternoon of Award Winning Ukulele Music at The Four Seasons Lodge at Koele, with Ukulele Falsetto Legend & Grammy Winner Richard Ho‘opi‘i, Grammy Winner Kawika Kahiapo, Ukulele Master Byron Yasui, Na Hoku Nominee CJ Boom Helekahi, Benny Uyetake, Hula Honeys, Lana‘i Kapuna Ukulele Group, Kalama School Ukulele Band and Hawaiian Language & Ukulele Workshops with Kaliko Beamer Trapp!! 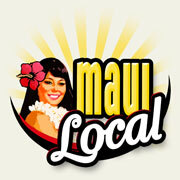 Sunday April 15th, enjoy an Ukulele Brunch, with CJ Boom Helekahi, at the Lodge at Koele! And you can find even more award winning Ukulele Music in downtown Lana‘i City, Sunday at The Blue Ginger Cafe, with Benny Uyetake, from 9am – 11:30am!! 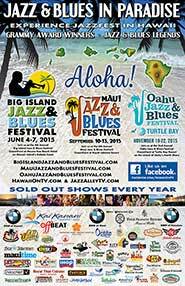 The Lana’i Jazz Festival is presented by the Lana’i Four Seasons Resort Lodge at Koele and Manele Bay, HawaiiONTV.com, Jazz Alley TV, Maui-Lana’i Expeditions Ferry, Maui Time Weekly, Lana’i Grand Adventures, Pau Maui Vodka, Maui Brewing Co., Lana’i Today, Cafe 565, Coffee Works, Lana’i ‘Ohana Poki Market, Island Treasures, The Local Gentry, Blue Ginger Cafe, Kamaka Ukulele, Cory Labang Studio, No Ka Oi Grindz, Lana’i Culture & Heritage Center, Lana’i Pine Sporting Clays, Trilogy, Maui FM 102 Nine, Koni FM 104, Lana’i Plantation Store, Dollar rent-a Car, ABB Executive Rentals LLC, Dreams Come True B&B, KIKU TV, Manao Radio, MauiFEST Hawai’i, LanaiONTV.com, Hale Moe Accommodations, Pele’s Other Garden, RB Steak House and all our Friends! 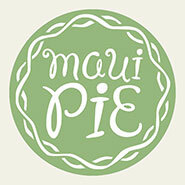 Please help with a Donations to the Lana’i Community Association! 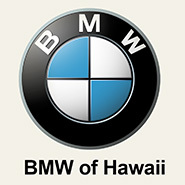 Helping the families of Lana’i!